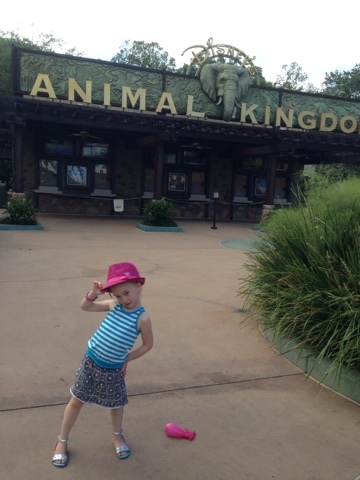 I think the Animal Kingdom was the park Maggie looked forward to the most. I knew the safari would be a huge hit, and I was right. 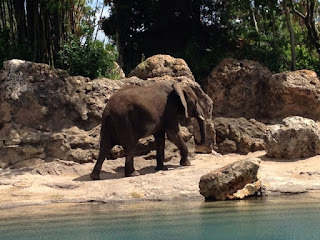 We got a bit of a late start on the park as we had breakfast at Chef Mickey's and had decided to drop a few things off at our room so we did a bit of backtracking. We still got to the park with time left on our Kilimanjaro Safari Fast Past. There was a bit of a line, so I was happy to use the Fast Past. 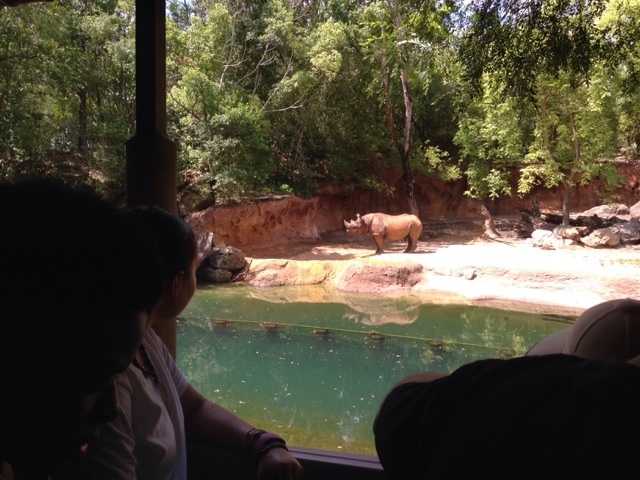 Maggie and Jessie were both thrilled to see so many different animals so close up! Maggie thought it was so neat to see the lion sitting on what seemed to be Pride Rock. 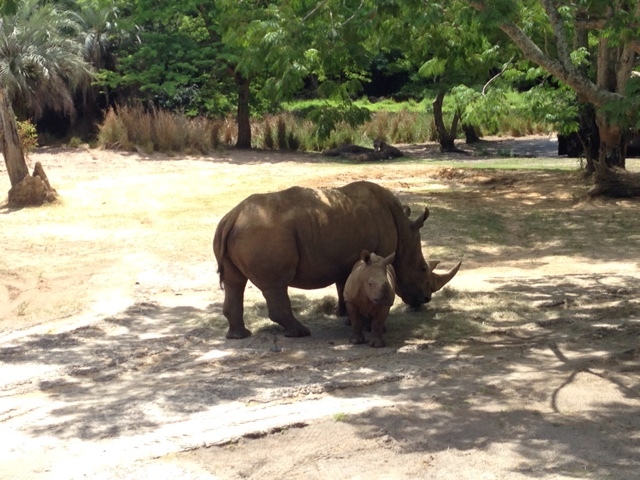 We even got to see a baby black rhino just one day old. Maggie and Rocky attempted to keep track of which animals we saw for the Wilderness Explorer badges, but as Maggie kind of lost interest, we just enjoyed the ride. 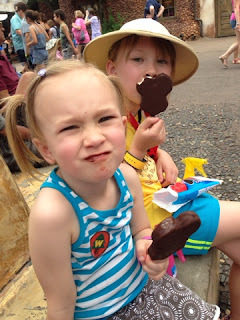 It was really hot, so we got some ice cream while waiting for the Festival of the Lion King! I had set up a Fast Pass, but the wait time was short, so we thought we'd use our Fast Pass on something else and went in. To start, our seats weren't very good, but as the show was about to start, we were able to move up so there was no one sitting in front of us! The girls enjoyed the show. Jessie liked the "circus monkey-men" (acrobats dressed like monkeys who did tricks during "Hakuna Matata"). Maggie liked the show, but wished Pumbaa and Simba weren't animatronic. We had lunch at the Rainforest Cafe, which both girls thought was too loud with the passing "thunderstorms," but they both ate most of their lunch. Maggie and Rocky went on a spinning/flying ride called TriceraTop Spin. I couldn't talk Jessie into it, so we just waited in the shade [it's too hot, Mom]. Maggie liked the ride because you could control if you went up or down. Next up was "It's Tough to be a Bug" in the Tree of Life. Maggie thought it was neat and Jessie liked most of it, but some was scary. We also went to "Finding Nemo: The Musical" I think this was my favorite part of the Animal Kingdom. It was a puppet show with the puppeteers actually in the show and not just operating the puppets. The musical was fun, colorful, toe tapping, humming the songs later type of show. 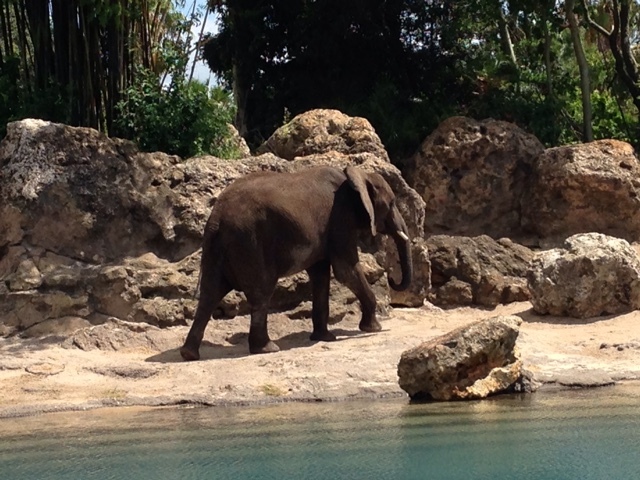 Overall, I think the Animal Kingdom was fun, though I wish it had been cooler. We left soon after Finding Nemo to hit the pool. We missed some of the "big" rides (though Jessie probably wouldn't have wanted to go one the splash ride), but we didn't have the energy to go to yet another area. I think this park would benefit from a railroad to get you from one side to the other. We saw a few characters in passing, but the girls weren't in the mood to wait in line for anything else. The pool was a welcome relief to us all. 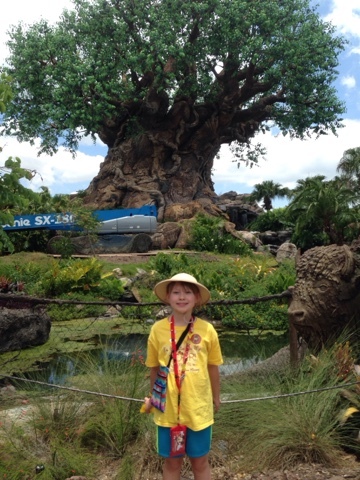 There are a lot of "extra to-dos" at this park (like the Wilderness Explorers -- plus the girls didn't really want to talk to strangers/cast members) and I think those are probably there for people who have been there before as it just felt like work to us.